KTM’s single-cylinder 390 Duke is a classic case of a good motorcycle that doesn’t overthink things. The single cylinder engine is the definition of internal combustion simplicity. It’s the oldest engine design out there, and its longevity is testament to the notion of making a good design right from the off. 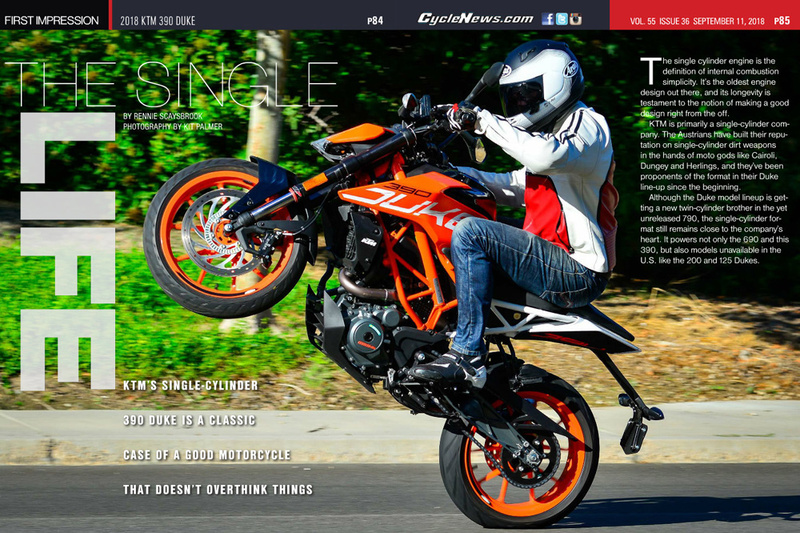 KTM is primarily a single-cylinder company. The Austrians have built their reputation on single-cylinder dirt weapons in the hands of moto gods like Cairoli, Dungey and Herlings, and they’ve been proponents of the format in their Duke line-up since the beginning. 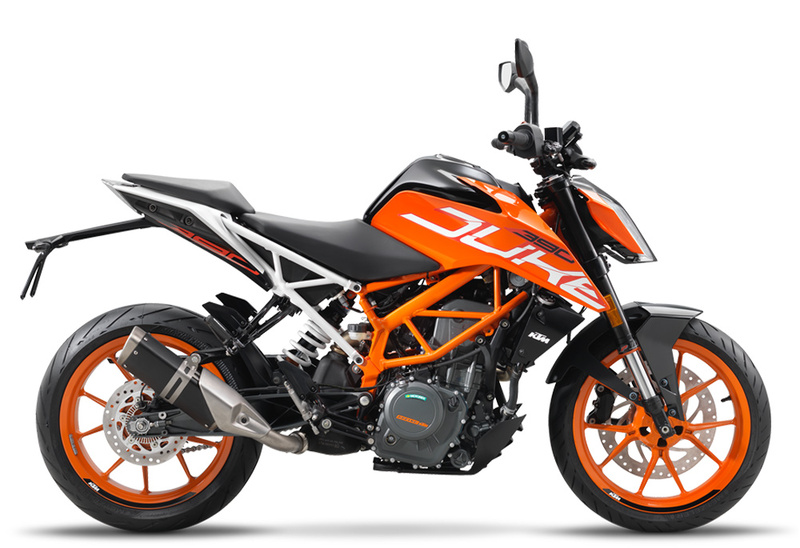 Although the Duke model line-up is getting a new twin-cylinder brother in the yet unreleased 790, the single-cylinder format still remains close to the company’s heart. It powers not only the 690 and this 390, but also models unavailable in the U.S. like the 200 and 125 Dukes. The 375cc single-cylinder engine sitting inside the KTM 390 Duke is thus one of the most advanced singles ever created. 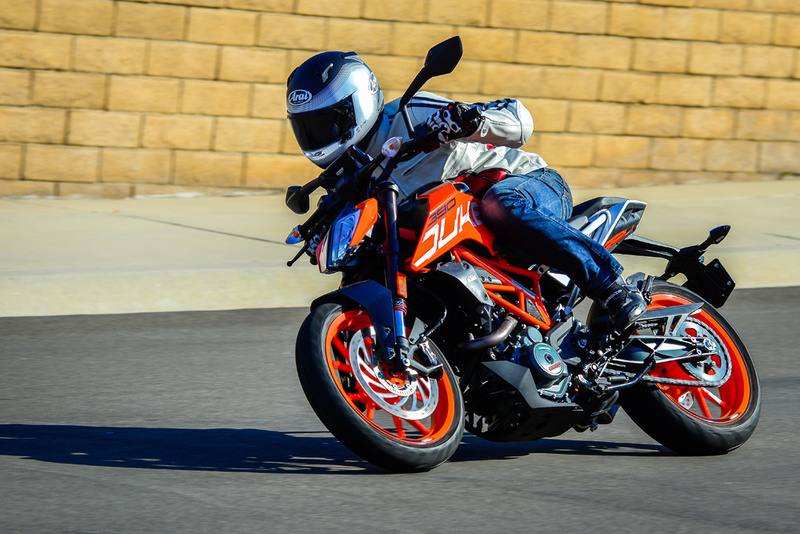 KTM claims the-little-engine-that-could produces 44 horsepower, and I can assure you that’s plenty of poke for lofting the front wheel away from traffic lights. Inside the einge sits a single piston with a diameter of 89mm, 8mm up on what is allowed in MotoGP. It’s a big ol’ lump of a thing, and you’ll really notice it when you’re cruising around at low speed in first and second gear as the engine tends to thump along, and at these speeds, the ride-by-wire throttle response isn’t really the nicest to experience. LED headlight looks awesome on 390, just like the big daddy 1290. Like many engines with at least a small sporting bone in its body, the 390 really begins to work when you’re pushing it hard. There’s plenty of torque on offer from the India-constructed engine between 3000-6000 rpm, ride-by-wire throttle response improving immensely as the connection between bike and rider grows and the speeds get faster. This connection is helped by top quality WP suspension. It may be non-adjustable up front and with preload adjustment only on the back, but the ride quality is really good on the little Duke. It’s sprung quite soft but will resist blowing through the stroke when you hit sharp bumps when cranked over at high speed. The chassis remains lovely and composed, for the most part, especially as the 390 is graced with Metzeler’s excellent Sportec M5 tire as standard. These are brilliant rubber hoops; I’ve ridden on many different bikes and these are quality additions to the 390 package, especially in wet conditions. The 390 is super slim and extremely easy to maneuver around. Braking is taken care of a single ByBre (Brembo’s Indian subsidiary) four-piston radially mounted caliper. The ByBre brakes can be hit and miss but on the Duke they are very effective, and matched to a Bosch two-channel ABS system that allows for the system to be turned to Supermoto mode and off altogether—which you’d only need to do if you’re planning on stunting or backing it into corners, something that sadly (for your license longevity), is insanely easy to do on a 390. The front brake lever is also span adjustable, which is a nice touch. The Duke is a tiny little thing. It is designed for riders smaller than I, as any attempt to get into a sporty riding position has me perched almost over the front wheel, even though the seat height was upped by an inch compared to the 2016 model. Ride position is great for short trips but longer ones can be a touch uncomfortable for taller riders. The ride position, if you’re on the taller side, is still surprisingly comfortable. The bar bend is angled quite sharply and when combined with the tank indents, you’ll be locked in place for some old-school fashioned naked biking. 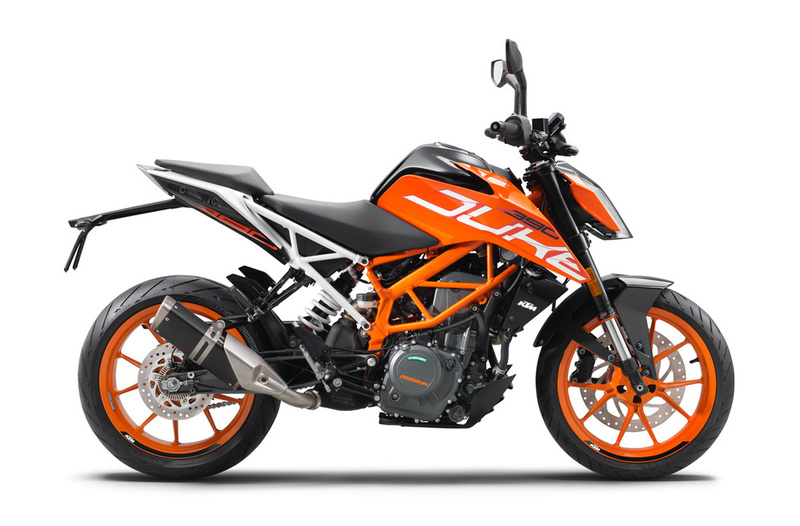 If you’re shorter, you’ll be much better accommodated with the 390 Duke, and the lighter riders will probably enjoy the seat padding more than the heavier set among us as it can get quite hard after 45 minutes on board. One of the best features with the 390 Duke comes in the form of the same TFT dash that sits on bikes like the 1290 Super Duke R. This is by far the most advanced dash in the class, and navigating it is super easy with gloves thanks to the four large buttons on the left handlebar—the same set-up as the big bikes. The rider also has the ability to pair a smart phone to the bike, listen to music, make and receive phone calls, etc, all through the dash’s inbuilt KTM MY RIDE system. Tuck down, fat boy! Here you can really see how small the 390 is. 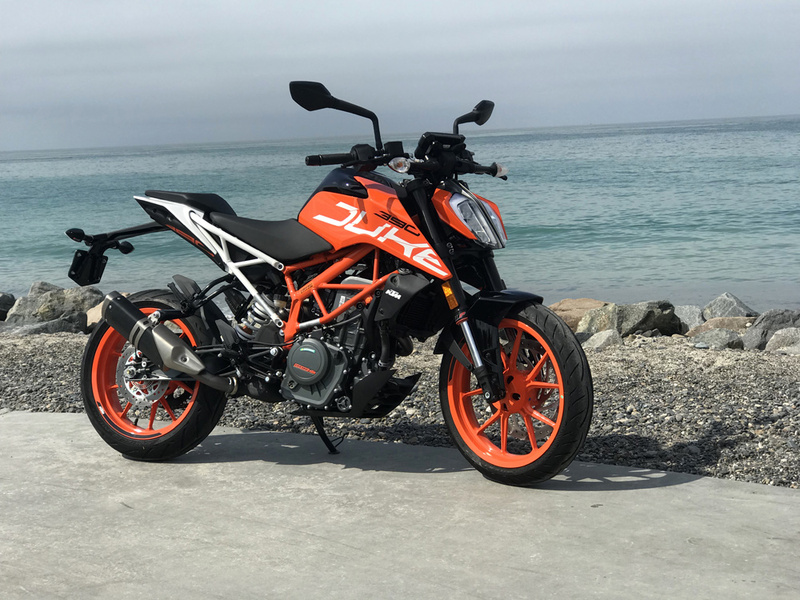 For 2018, the 390 Duke gets a new LED headlight with a daytime running light, the same as the big bikes from KTM, and, at a glance, you could be forgiven for thinking this was a 1290, as it has the same graphics, white subframe and orange wheels. There’s a direct lineage between this 390 and the 1290, a linking of the family, if you will. 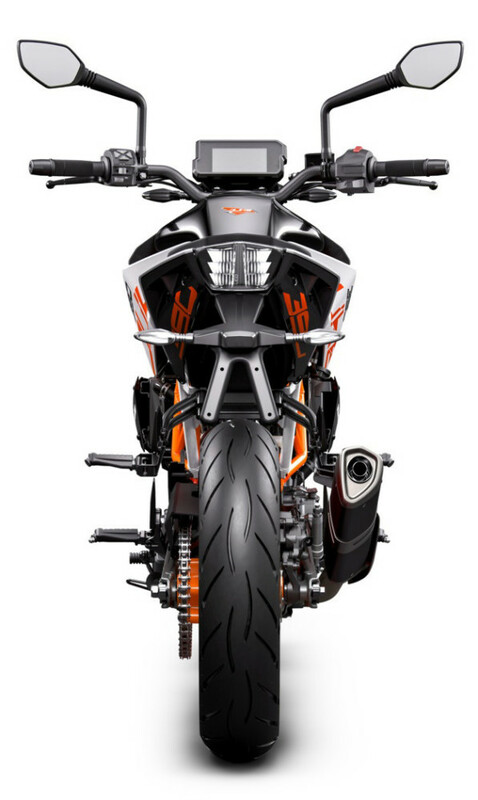 This is clearly a deliberate approach from KTM to keep the rider who starts motorcycling on a 390 in the KTM fold in the hope they will graduate to a more powerful, orange painted bike in the future. Fuel injection: Electronic fuel injection system. Claimed dry weight: 328.5 lbs. 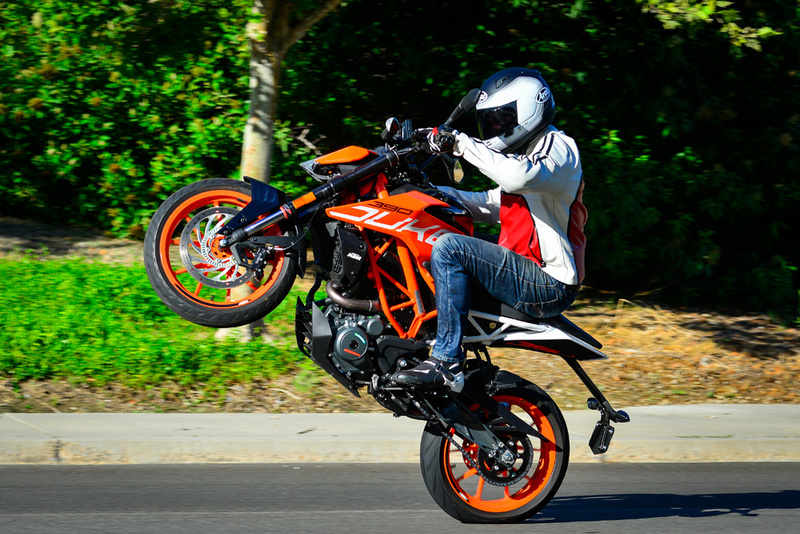 Click here for more KTM motorcycle reviews and news.